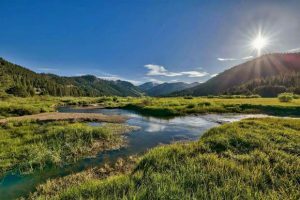 TAHOE CITY, Calif. — Anyone standing on the new wood-planked boardwalk surrounded by the lush, green meadow dotted with yellow flowers within Ward Creek Park would have been standing in a water-entrenched trail this time last year. 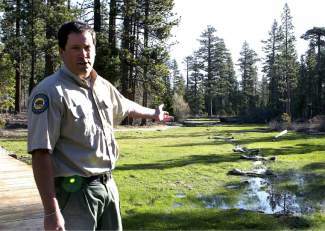 Nathan Shasha, an environmental scientist for California State Parks, explained this during a recent tour of the newly restored park, a 179-acre connector park off Lake Tahoe’s West Shore ready to offer users a fresh recreation experience this summer. “The major goal was to reduce erosion and sediment that the roads and trails were causing and to improve the visitor experience in the park,” Shasha explained. Before the improvement project got under way in the summer of 2011, the park was composed of old logging roads and a network of user-created trails from over the years, the remains of which are still visible in the meadow, with water pooling within those snaking indented pathways. “This time last year, people couldn’t come out here and really get a good experience in the park … because they would be in wet, boggy areas,” Shasha said. Not only that, but the user-created trails throughout the meadow were harming its ecosystem. “What happens is the water comes down the meadow, hits the entrenched trail surface and the trail shoots the water off this way, depriving this half of the meadow, (when) the water should be going all the way across,” he said. To rehabilitate the meadow, sod plugs were put in and the elevated boardwalk was built, providing users a dry, designated path to follow, while allowing water to flow under and spread across the meadow. Tucked behind the Rideout Community Center on Timberland Lane in Tahoe City, the park greets users with an elevated, log-framed sand- and rock-compacted trail, one used throughout the surrounding meadow area, before transitioning into a more natural, elevated dirt-and-pebble trail within the park’s interior, which is forest land. “You want the aesthetics to be appropriate for the environment you’re in,” said Shasha, explaining the choice of trail materials. Another consideration when creating the trails were their position, he said, acknowledging the paths people created over the years and trying to adhere to them, in an effort to prevent the re-creation of user-made trails. That includes an access point on the banks of Ward Creek, located at the park’s northern boundary. Shasha, while overlooking the creek’s rushing waters, explained how people before the park improvements would “scramble” up its steep bank, causing dirt and sediment to go into the creek, which feeds into Lake Tahoe. To reduce that erosion and improve public safety, a dirt staircase framed by logs and bordered by rocks was installed. “In an ideal world, there wouldn’t be a trail coming straight up the bank, but people would just reoccupy it,” he said. As Shasha followed the trail away from Ward Creek, the sound of its rushing waters dying in the background, a biker and her dog using the interior trail crossed his path. Before continuing her ride, she said she plans to use the park as much as possible until the school year ends. As he moved along the interior trail, Shasha explained that it use to be an old dirt logging road, showing before-spring pictures of it being completely under water, a result of snowmelt runoff and/or heavy rains. 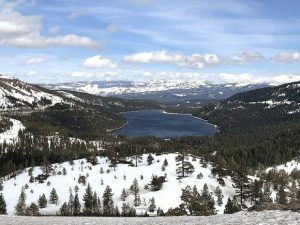 Using rocks and tree parts provided by the California Tahoe Conservancy, the logging roads were narrowed, reconnecting their edges with the natural surrounding topography, and eliminating one of the higher-up roads, since it acted as a “goalie” for runoff, Shasha said. “Basically, we just (broke) it up, so there’s not any linear flow path, so if water does come down, it hits these berms and pools, and it slows down and it essentially drops out,” he said. Walking on a dry trail speaks to the success of the improvement project, Shasha said. More sod plugs will be put in along the old user-made trail alignments in the next few weeks to continue the meadow’s rehabilitation, Shasha said. In addition, park signs will be installed in late summer or early fall, highlighting some of the rules and regulations of the park, such as staying on designated trails; dogs are allowed, but must remain on-leash; and no motor vehicles or horses are allowed. Other signs will include a wildlife panel, a meadow’s environment panel and a forest panel. 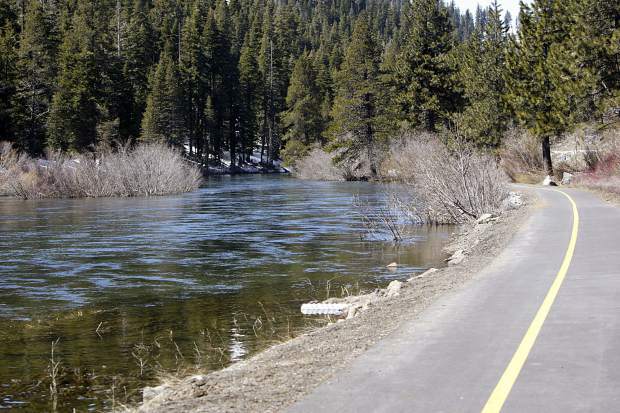 Those upgrades, along with the trail and meadow improvements that were completed in October 2012, cost approximately $500,000, with the bulk of the funding coming from the Lake Tahoe Environmental Improvement Program. Work was supplemented with the California Conservation Corps through Proposition 84 funding, a bond act that funds water quality and supply and other protection efforts. Every time he spotted a park user during the tour, Shasha’s excitement was clearly visible. “It makes all the hard work come together, makes you realize that the project was a success, and you achieved that goal of improving the visitor experience of the park, while improving the environment,” he said.